The Brickyard is a 6-story building on the northeast corner of Mill Ave. and 7th St. in downtown Tempe. If you are coming from downtown Phoenix, take the 202 freeway east and exit southbound on Priest. When you come to University Ave., turn left (east) and drive until you come to Mill Ave., which is the primary north-south street through downtown Tempe. At the bottom of the ramp, turn left and drive until you come to a wall. The elevator will then be on your left. Find a parking space and take the elevator to the 3rd floor. When you exit the elevator, turn LEFT. 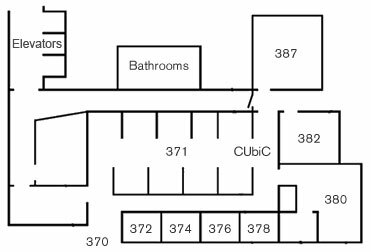 See below for map of CUbiC lab. WANT THE LATEST CUbiC NEWS?